Chess insecticide is a new aphid solution which combines biological efficacy with low toxicity and low impact on beneficial insects. Contact or ingestion of Chess insecticide causes aphids to quickly stop feeding and then perish due to starvation. Chess insecticide features a unique mode of action with no cross-resistance . Chess insecticide is suitable for use on the following plants: CHESS 500 WG controls Green Peach Aphids and Cabbage Aphids in Brassica Vegetables (Broccoli, Brussels Sprouts, Cabbage, and Cauliflower), Green Peach Aphids in Potatoes and Black Peach Aphids and Green Peach Aphids in Stone Fruit (Apricots, Nectarines, Peaches, Plums). 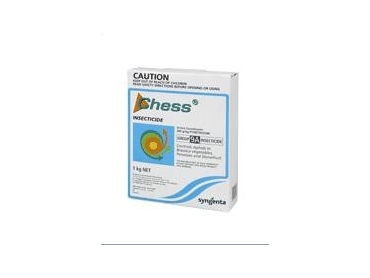 Chess insecticide is available from Syngenta .